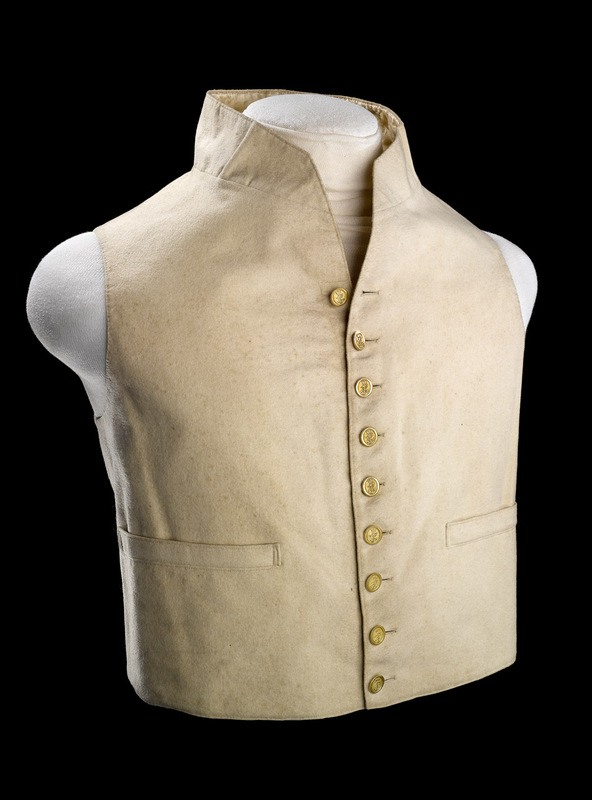 A British navy waistcoat, worn by either a captain or commander, (circa. after 1812). In this series I have been making a midshipman uniform for my 9-year-old son. The period I am focussing on for this uniform is the years between 1795-1812. 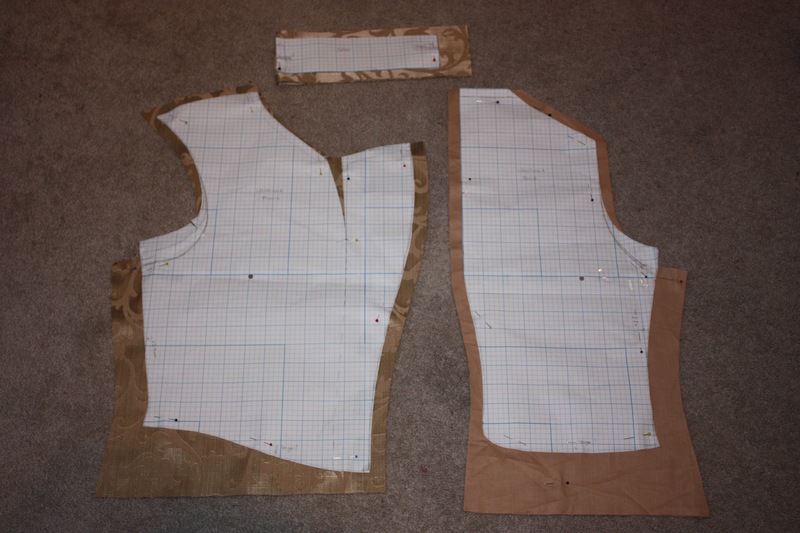 In this particular post I have been working on a waistcoat. One of the difficulties I am facing is that not many extant midshipmen uniforms have survived, so it is a little more difficult to find out the exact regulations for the the time period than merely looking at museum pieces. There are also less pictures (both paintings and cartoons) of midshipmen versus those of higher naval rank. I am also working to a deadline, as my son would like to wear this uniform next month for “Book Week” at his school. This deadline has squashed any desire in me to search for copies of British Navy regulations to peruse! 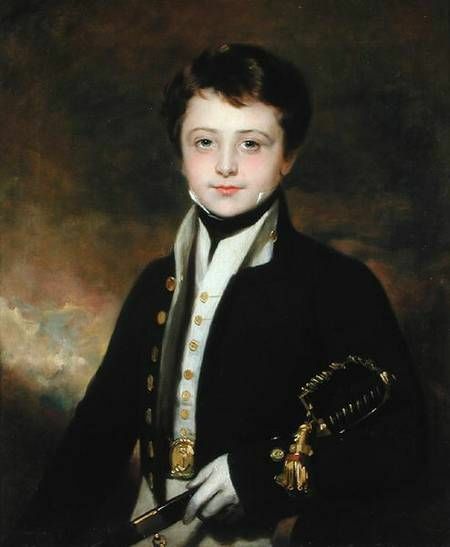 A Portrait of a Midshipman, by Sir Martin Archer Shee. The British navy uniform included a white, woven wool, single-breasted waistcoat for all its officers. 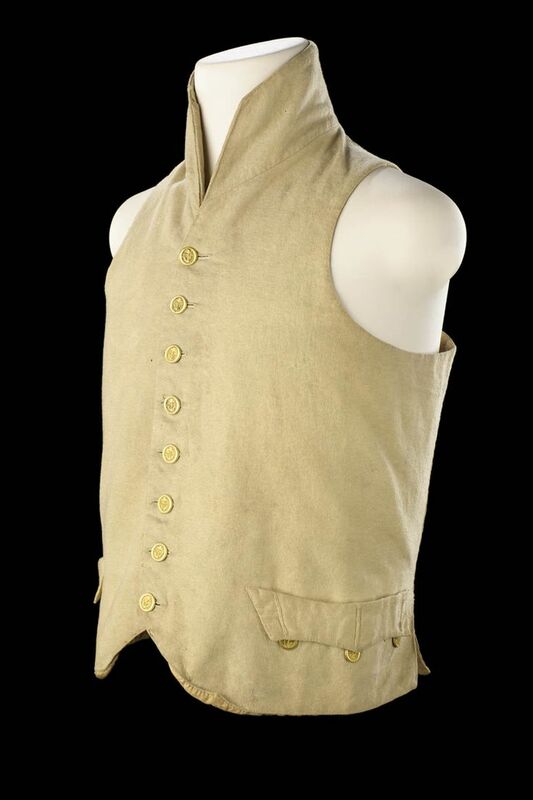 This waistcoat featured an upstanding collar, pockets (flap pockets earlier in the period and welt pockets later), and brass buttons. The Royal Museums Greenwich states that the pattern on the buttons indicate the rank and status of the wearer, and Diana’s Buttons have a useful summary of the British naval buttons through the 18th and 19th centuries. The waistcoat could be lined with cotton or silk, backed with cotton, and with the fronts and facings (if they had facings) in wool. 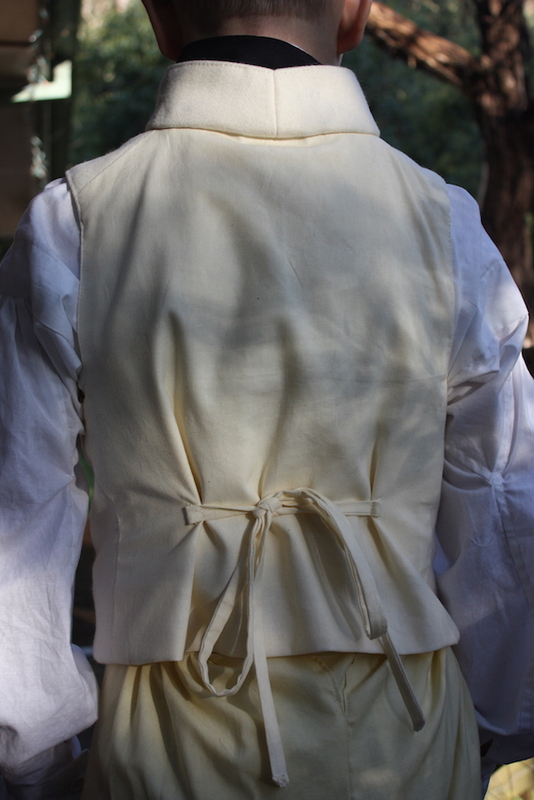 Waistcoats of this era also often had tapes (or eyelets and cord) at the back for adjustment. My pattern inspiration initially came from the all the extant waistcoats I could find. None of these are identified as midshipmen waistcoats, and the paintings of midshipman don’t always show the waistcoat clearly, so my general assumption is that they were all similar. A waistcoat from the uniform of a British naval surgeon, (circa. 1807). I looked at The Cut of Men’s Clothes, by Norah Waugh, and Costume Close-Up, by Linda Baumgarten for ideas on the shapes of pattern pieces, particularly the collar. Both of these books have examples of waistcoats from the 1790’s. From this information I draped the lining on my son and cut away! *gasp* This is the first garment that I have actually draped with fabric. Having recently made a vest for an Oliver production may have helped my courage! 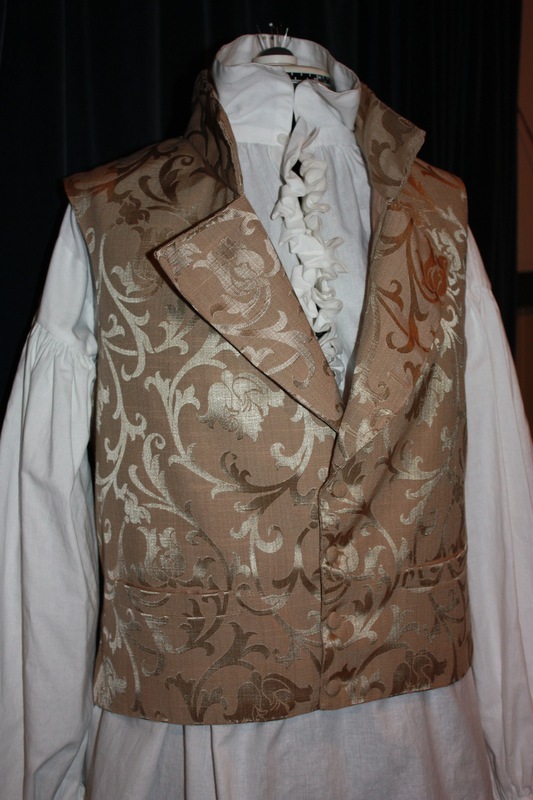 The front panels were made from cream wool, and the waistcoat was lined and backed with ivory cotton broadcloth. The buttons have a fouled anchor imprint and are made from gold-coloured metal. A modern waistcoat is relatively simple to make, as it generally consists of sewing two side seams and attaching buttons to the front. For this reason I have not gone through every step of the construction process. 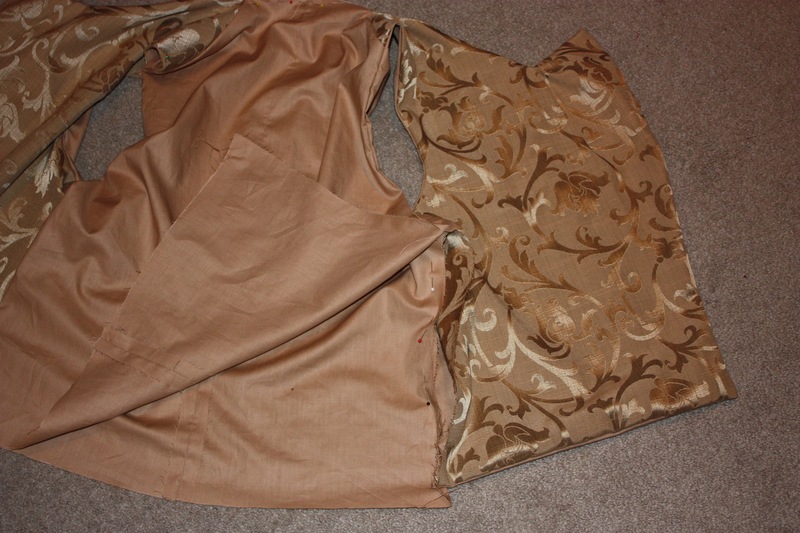 If you are interesting in seeing each step of a Regency waistcoat, you can refer to my previous post, MY Mr Knightley: Making a Regency Waistcoat. What is different in Regency waistcoats is the collar and pockets, as many modern vests do not have these features. I drafted the collar piece after examining the pattern pieces in Costume Close-up. It seems that many collars were seamed at the centre back. This has the effect of drawing them in closer around the neck. The grainline was often vertical in historical pieces, but in modern wear collars often have the grainline running horizontally. 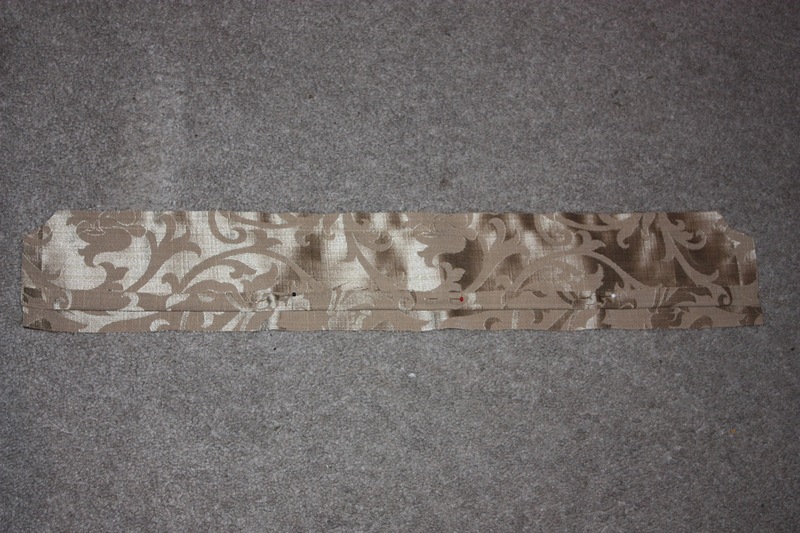 The pattern for the collar piece. To the left is the centre back and to the right is the centre front. No seam allowances have been added to the pattern. I put in welt pockets, using a tutorial from Craftsy. The buttonholes were slashed and handsewn with buttonhole stitch, and the buttons sewn on. You can see the edges of the waistcoat have been handsewn through all thicknesses with a running stitch to help keep the wool flat. The buttons and handsewn buttonholes, and the centre front edges sewn with running stitch. 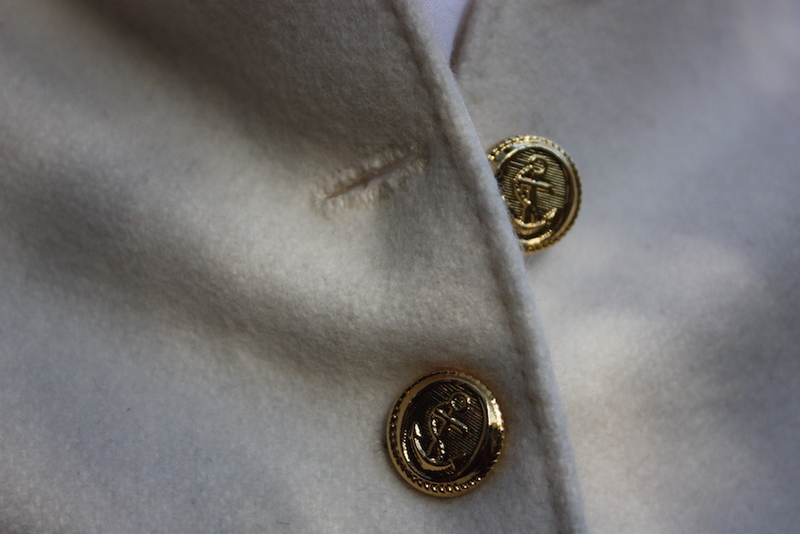 Keep an eye out for my next post in this series, making a midshipman coat. The third item of clothing for my Mr Knightley is a waistcoat. Regency waistcoats were often the most colourful and patterned item in the entire man’s ensemble. They could be made from silk or sometimes cotton, and were often lined with linen. Sometimes they were embroidered, as they had been in the 18th century, or else they could have patterns woven into the material. Waistcoats were worn with an upright collar and were cut straight across the bottom, with usually two inches of it showing underneath the bottom edge of the tailcoat. They always had self-covered buttons, and could be either double-breasted or single-breasted, with or without a lapel. I have used a pattern adapted from an 1850’s waistcoat pattern in Norah Waugh’s The Cut of Men’s Clothes. The pattern was very similar to Regency ones, and only needed minor adjustments to fit the era. 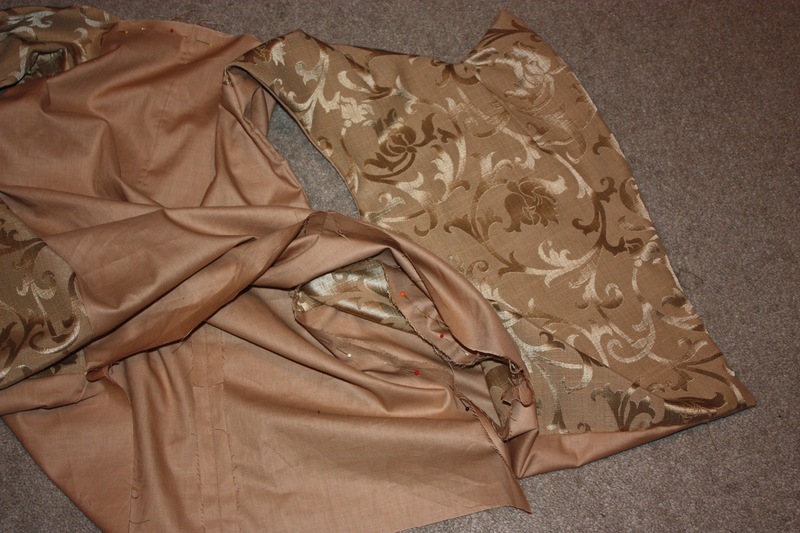 My waistcoat is made from curtain brocade, and lined with cotton broadcloth. 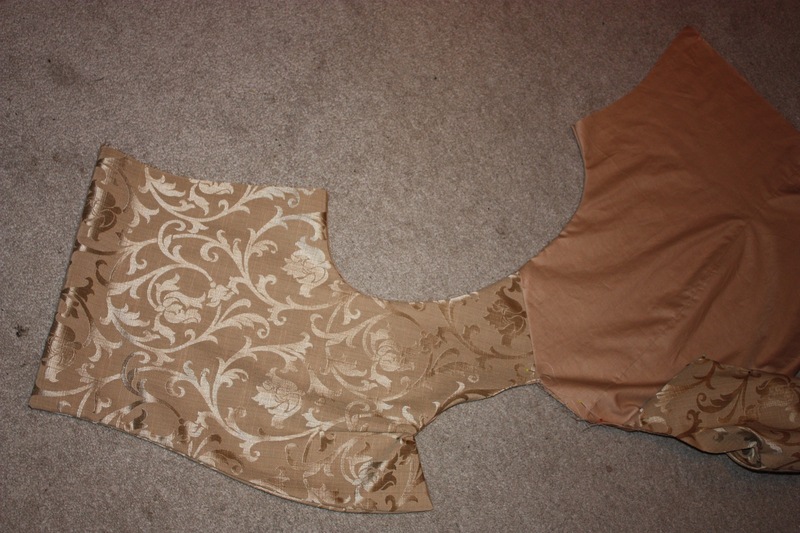 Once I had drafted the pattern pieces onto paper and measured my husband, I did a toile out of calico. Based on this fitting I made some adjustments to the original pattern, which can be seen in the photo below. I lengthened it slightly and straightened the bottom of the waistcoat. I had to make the armholes a bit deeper underneath the arms and the neckline a bit lower all the way around. Because the neckline was adjusted, I also had to make the collar a little longer. I also added an inch in each side seam. Step One: In order for the lapel to be reversed, the front lining piece is made up of half lining fabric and half outer fabric. Allow enough for a seam allowance to join the two when cutting them out, and then sew them together. Front lining piece, with a section of outer material sewn inside to create a rever. 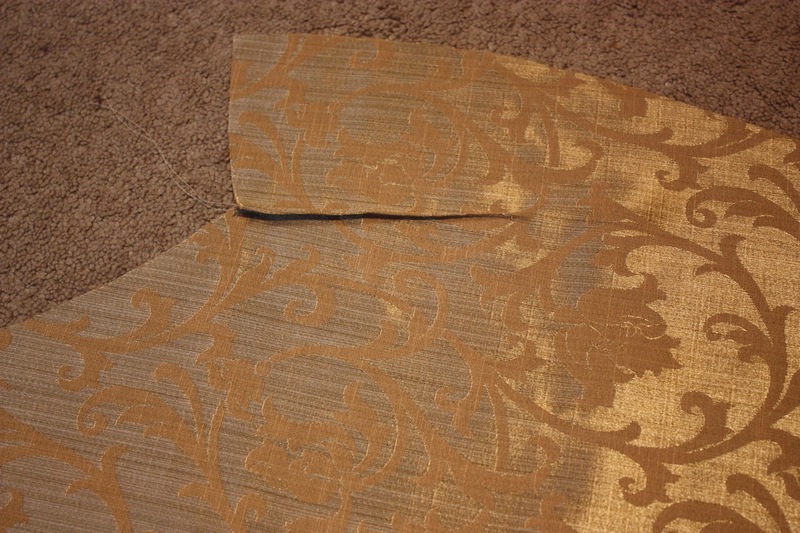 Step Two: Taking the markings from the pattern piece, sew the front lapel section to the front piece using a dart. Repeat for the lining pieces. Step Three: Sew the centre back seam. Repeat for the lining. 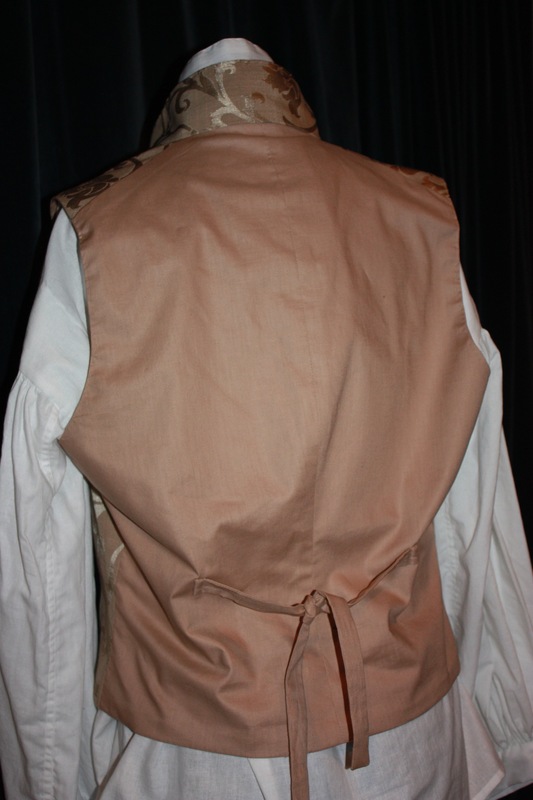 It was common in the Regency to have the back of a waistcoat made and lined in the same material, and in this case I have used the cotton broadcloth as the lining and the outer. Step Four: Sew the shoulder seams. Repeat for the lining. 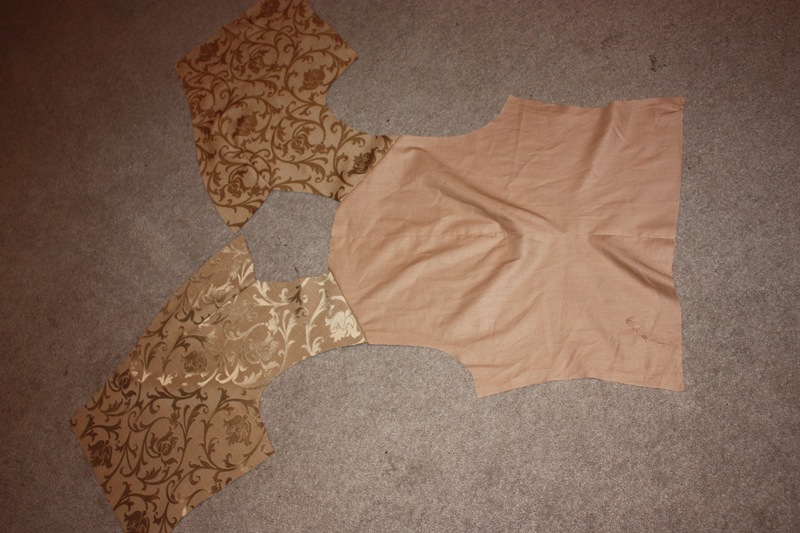 Step Five: Lay the lining and outer pieces down on top of each other, right sides together. Sew around the arm holes. Sew from the top of the front lapel down to the bottom of garment and across the bottom to the side seam. Turn the right way. All turned inside out. The un-sewn neckline can be seen pinned. The un-sewn side seams can also be seen. This creates a nice finish for the armholes. Step Six: Sew the side seams of both the lining and the outer at once, repeating for the other side. The pinned seams should form a circle to sew around. The lining side seams are pinned, ready to sew. The outer side seams are not (see below). 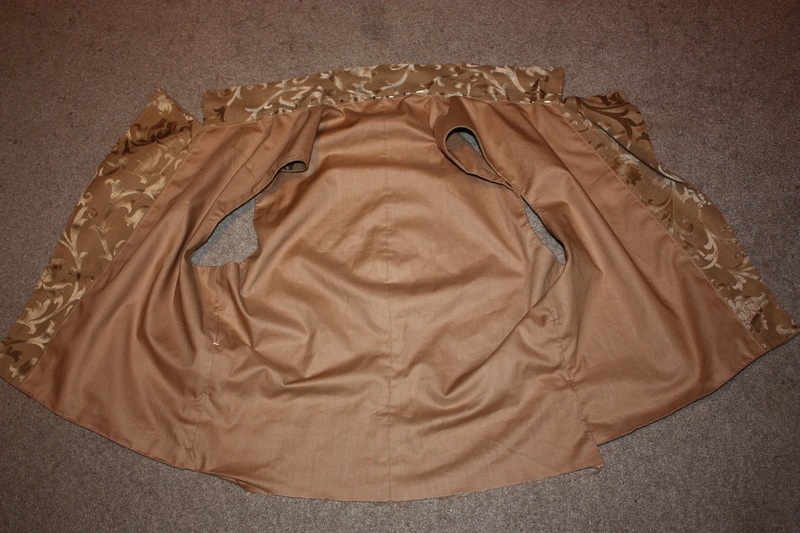 Both the lining and the outer side seams are pinned here, forming a circle to sew around. Step Seven: With right sides together, pin the collar facing and outer together on three sides, turning up the facing on one of the long sides. Sew and then turn the right way. The collar sewn, with corners clipped, but still inside out. The turned up edge of the lining piece can be seen. In hindsight, this collar piece should have had the ends cut on more of an angle, which I did not realise at the time. 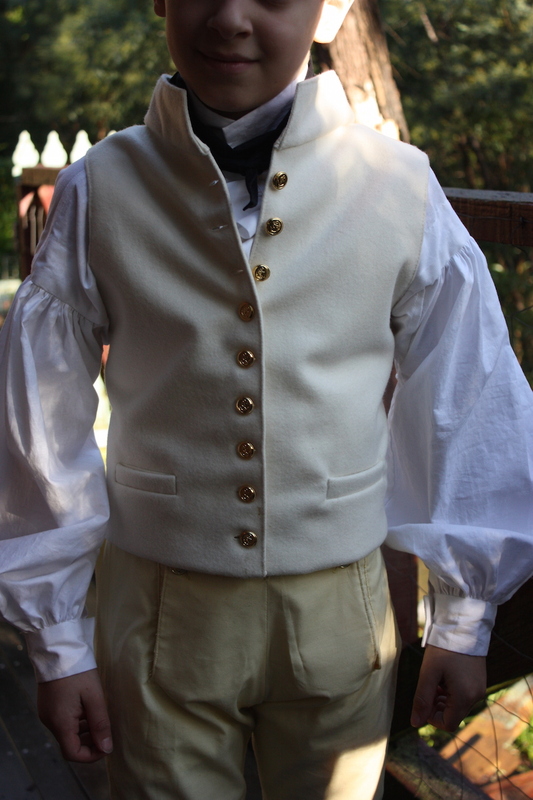 I made this adjustment when I made a Regency waistcoat for a midshipman uniform. Step Eight: Sew the un-turned edge of the collar to the neckline. Turn the collar facing to the inside, folding under the raw edge, and hand stitch along the inside of the neckline. The collar has been attached and is pinned ready to hand sew. At this stage I put small (invisible?) hand stitches all around the edge of the hem, lapel and collar to keep the edge defined and flat, as the brocade would not stay properly flat with just ironing. 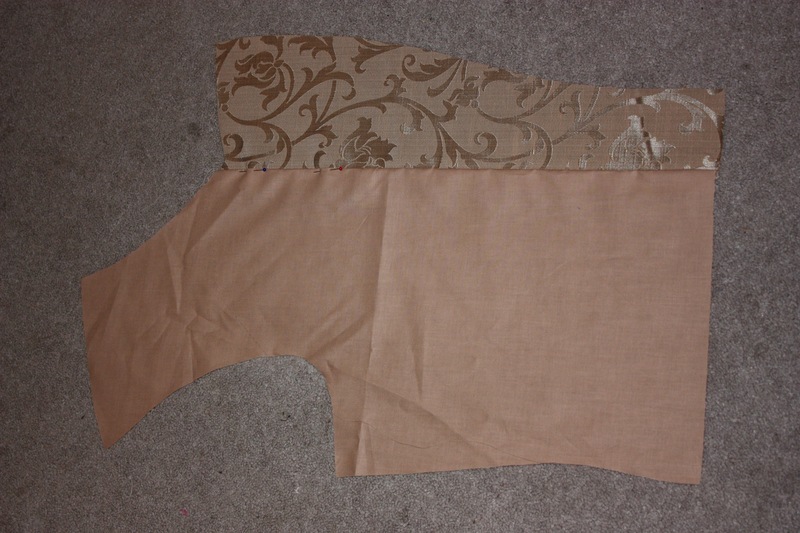 Step Nine: I decided to do a pair of welt pockets on each side, using the instructions from Slightly Obsessed. It can be less fiddly (and probably recommended) to do these first, but one of the benefits of doing it later is that you are able to make sure they are even, as the garment is basically finished. Step Ten: Finishing off! Using some small strips of lining material, make some ties for the back. Sew the buttonholes and cover and attach the buttons. 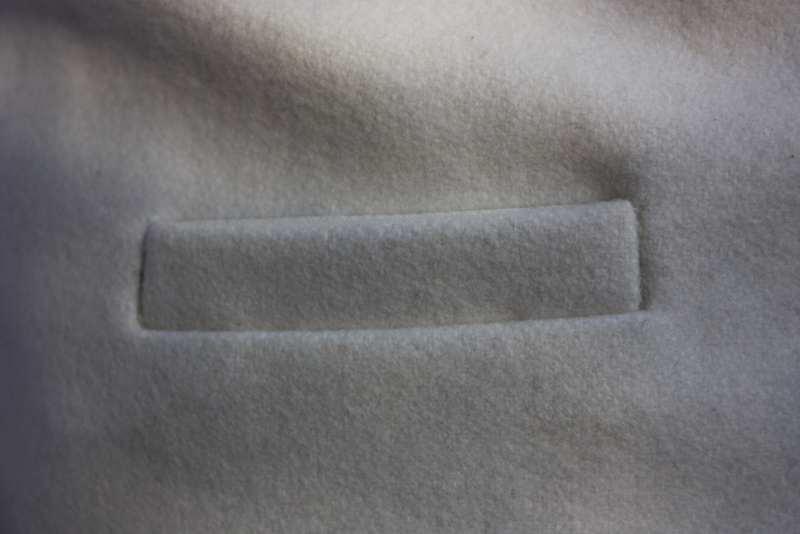 Hem the bottom edge of the back with a hand stitch or machine topstitch. Here are the finished pictures, and I am really pleased with how it turned out! Next in my Regency man’s wardrobe is a tailcoat. A bit of a challenge for me! You can read all my posts in order at My Regency Journey, under MY Mr Knightley. The Cut of Men’s Clothes, by Norah Waugh – buy through Amazon. There is a pdf version online as well. 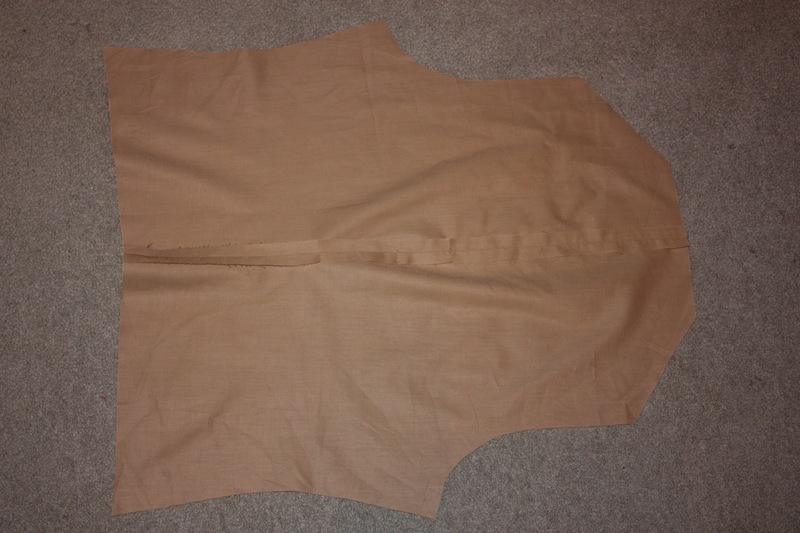 How to make welt pockets – From Slightly Obsessed, specifically for a Regency waistcoat.